Total knee replacement is now a routine operation for knee pain and disability. The end result should be a painless and movable knee which you can use quite normally in daily life. Due to the pain and stiffness after the operation, you will have to work hard to regain muscle power, mobility and knee bend. Co-operation with your physiotherapist is vital for you to achieve the best start with your new joint, and to set the programme for the following months. It may take few days for all the pain and swelling to settle down and you will have to keep your knee working during this time. Work hard with your physio and you will do well. You are likely to get up on the first day after your operation, or perhaps the second, depending on the surgeon�s wishes and your medical condition. This is usually done by a physiotherapist with an assistant. 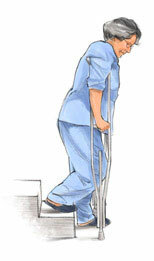 You will use crutches or a frame for a period as designated by the physiotherapist or surgeon. In most cases you can put your weight through your knee as able, and progress to using sticks as advised. In some cases, such as revisions and uncemented replacements, weight-bearing may be restricted and the time using crutches longer than the routine amount. You should be able to sit out in a chair as you feel able, with your leg up on a support. Try to eat the regular meals provided so the body can heal quickly. Drink plenty of fluids to prevent dehydration and urinary problems. Do your knee exercises hourly for a few minutes, as directed by your physiotherapist. Rest your leg between these times. Your physiotherapist will tell you when you are safe to get on and off the bed and walk on your own. The wound is usually left covered for the first 48 hours, then checked and re-covered. Start the following exercises as soon as you are able. You can begin these in the recovery room shortly after surgery. You may feel uncomfortable at first, but these exercises will speed your recovery and actually diminish your postoperative pain. Tighten your thigh muscle. Try to straighten your knee. Hold for 5 to 10 seconds. Repeat this exercise approximately 10 times during a two minute period, rest one minute and repeat. Continue until your thigh feels fatigued. 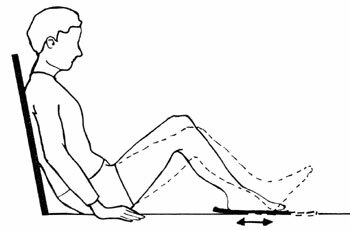 Tighten the thigh muscle with your knee fully straightened on the bed, as with the Quad set. Lift your leg several inches. Hold for five to 10 seconds. Slowly lower. Repeat until your thigh feels fatigued. You also can do leg raises while sitting. Fully tighten your thigh muscle and hold your knee fully straightened with your leg unsupported. Repeat as above. Continue these exercises periodically until full strength returns to your thigh. Move your foot up and down rhythmically by contracting the calf and shin muscles. Perform this exercise periodically for two to three minutes, two or three times an hour in the recovery room. Continue this exercise until you are fully recovered and all ankle and lower-leg swelling has subsided. Place a small rolled towel just above your heel so that it is not touching the bed. Tighten your thigh. 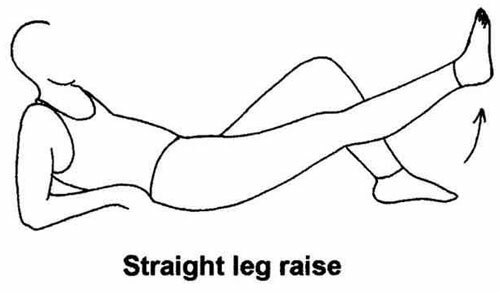 Try to fully straighten your knee and to touch the back of your knee to the bed. Hold fully straightened for five to 10 seconds. Bend your knee as much as possible while sliding your foot on the bed. Hold your knee in a maximally bent position for 5 to 10 seconds and then straighten. Repeat several times until your leg feels fatigued or until you can completely bend your knee. While sitting at bedside or in a chair with your thigh supported, place your foot behind the heel of your operated knee for support. Slowly bend your knee as far as you can. Hold your knee in this position for 5 to 10 seconds. While sitting at bedside or in a chair with your thigh supported, bend your knee as far as you can until your foot rests on the floor. With your foot lightly resting on the floor, slide your upper body forward in the chair to increase your knee bends. Hold for 5 to 10 seconds. Straighten your knee fully. Soon after your surgery, you will begin to walk short distances in your hospital room and perform everyday activities. This early activity aids your recovery and helps your knee regain its strength and movement. Proper walking is the best way to help your knee recover. At first, you will walk with a walker or crutches. Your surgeon or therapist will tell you how much weight to put on your leg. Stand comfortably and erect with your weight evenly balanced on your walker or crutches. 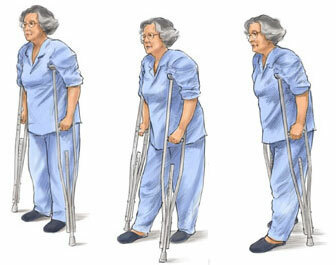 Advance your walker or crutches a short distance; then reach forward with your operated leg with your knee straightened so the heel of your foot touches the floor first. As you move forward, your knee and ankle will bend and your entire foot will rest evenly on the floor. As you complete the step, your toe will lift off the floor and your knee and hip will bend so that you can reach forward for your next step. Remember, touch your heel first, then flatten your foot, then lift your toes off the floor. Walk as rhythmically and smooth as you can. Don't hurry. Adjust the length of your step and speed as necessary to walk with an even pattern. As your muscle strength and endurance improve, you may spend more time walking. You will gradually put more weight on your leg. You may use a cane in the hand opposite your surgery and eventually walk without an aid. When you can walk and stand for more than 10 minutes and your knee is strong enough so that you are not carrying any weight on your walker or crutches. You can begin using a single crutch or cane. Hold the aid in the hand opposite the side of your surgery. You should not limp or lean away from your operated knee. The ability to go up and down stairs requires strength and flexibility. At first, you will need a handrail for support and will be able to go only one step at a time. Always lead up the stairs with your good knee and down the stairs with your operated knee. Remember, "up with the good" and "down with the bad." You may want to have someone help you until you have regained most of your strength and mobility. Stair climbing is an excellent strengthening and endurance activity. Do not try to climb steps higher than the standard height (7 inches) and always use a handrail for balance. As you become stronger and more mobile, you can begin to climb stairs foot over foot. Once you have regained independence for short distances and a few steps, you may increase your activity. The pain of your knee problems before surgery and the pain and swelling after surgery have weakened your knee. A full recovery will take many months. The following exercises and activities will help you recover fully. Standing erects with the aid of a walker or crutches lift your thigh and bend your knee as much as you can. Hold for 5 to 10 seconds. Then straighten your knee, touching the floor with your heel first. Repeat several times until fatigued. Lying on your back, place a folded towel over your operated knee and drop the towel to your foot. Bend your knee and apply gentle pressure through the towel to increase the bend. You can place light weights around your ankle and repeat any of the above exercises. These resistance exercises usually can begin four to six weeks after your surgery. Use one- to two-pound weights at first; gradually increase the weight as your strength returns. Exercycling is an excellent activity to help you regain muscle strength and knee mobility. At first, adjust the seat height so that the bottom of your foot just touches the pedal with your knee almost straight. Peddle backward at first. Ride forward only after a comfortable cycling motion is possible backwards. As you become stronger (at about four to six weeks) slowly increase the tension on the exercycle. 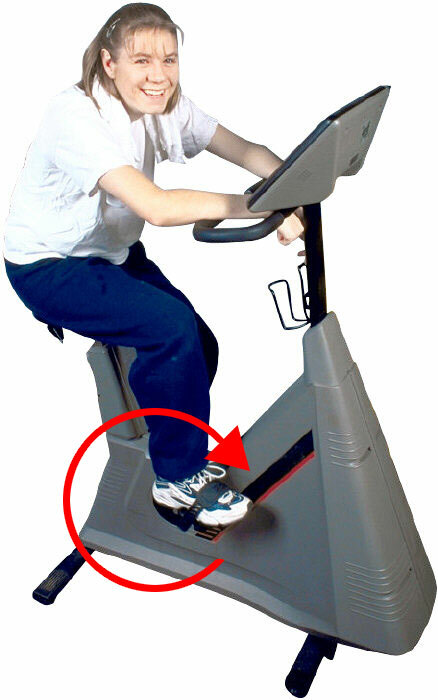 Exercycle for 10 to 15 minutes twice a day, gradually builds up to 20 to 30 minutes, three or four times a week. Pain or Swelling after Exercise You may experience knee pain or swelling after exercise or activity. You can relieve this by elevating your leg and applying ice wrapped in a towel. Exercise and activity should consistently improve your strength and mobility. If you have any questions or problems, contact your orthopedic surgeon or physical therapist.